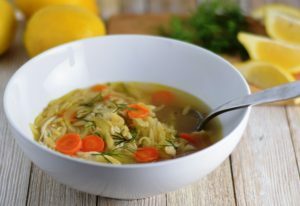 A flavorful, comforting, light version of chicken and noodle soup that’s been kicked up a notch with a bit of lemon. Although the weather was cold today, the sky was bright blue, the sun was shinning and the flowers have started to bloom. Because my husband is sick with a cold, I wanted to make something to help him feel better and also something appropriate to give thanks to this beautiful, cool almost springtime day. The warm broth soothes a sore throat, the steam eases congestion and the soup nourishes the soul. I like the texture of the al dente orzo in this soup versus heavy dense egg noodles that are in a most chicken and noodle soups. Orzo is a small pasta shaped like a large grain of rice. Many of the ingredients in this recipe have health benefits. Leeks, along with onions, garlic, shallots, are from the allium family – all of which are supposed to help fight cancer – another great benefit. Lemons are high in vitamin C – something else to help kick a cold. The orzo will soak up the broth. If you have leftovers, as you warm this up, add some extra broth. Heat olive oil in a large pot over medium heat. Add leeks, celery, carrots, and green onions and season with salt and pepper. Stir often and cook for 5-7 minutes until vegetables are soft. Stir in garlic and cook for another minute. Add chicken broth and bring to boil. 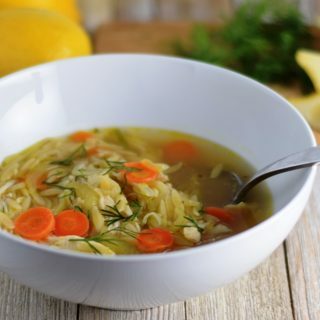 Add orzo to broth and cook until al dente, 8-10 minutes. Remove pot from heat, add chicken. Spoon soup into individual bowls, squeeze a wedge of lemon into the bowl and top with chopped dill and freshly ground black pepper. I will have to fix this. Looks and sounds yummy!